If you have ever considered indulging your cowboy/cowgirl fantasy, then this is the way to do it! I just finished my 5 day trail ride with Hondoo Rivers & Trails, and was sorry to leave. Well Managed; Well Prepared: Pat at Hondoo Rivers & Trails manages the business in a organized and "can do" fashion. 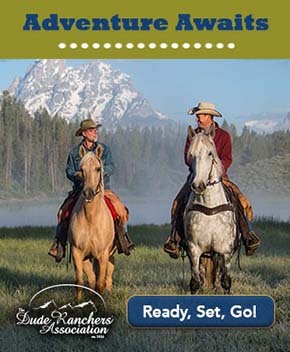 I completed a profile to help match me to my horse, and she sent me a very helpful packing list and FAQ sheet. Hondoo has well-trained horses and accommodates even novice riders (even city slickers such as myself). Hondoo takes care of its riders - safety is a foremost consideration, and your ride leaders will be quick to check your gear and give constructive advice. I found both very helpful (especially since my lessons were English and the ride was Western). Hondoo also cares for its horses very well; and you will also be expected to treat them with the respect and consideration they deserve. If you're a horse person you're already saying" "Of course!" and "Good!" Hondoo Goes The Extra Mile: In addition to being expert guides (with all the care and knowledge that entails), Pat and her team are friendly, considerate, helpful and fun to spend your vacation with, and they easily share their knowledge of local side-trips and information that will make your trip easy and memorable. You can't do better for practical advice from local experts. Excellent Variety of Services: Hondoo offers both inn-to-inn rides, and camping rides. I understand that they also offer photographic tours by motor vehicle and self-guided hikes, but did not go on those. The hikers I met when we were returning around the same time all seemed content with their hikes. 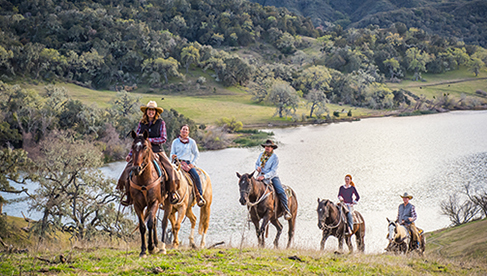 Wonderful Vacation: I do know all the riders on my trail ride were very happy with their experiences with Hondoo. We each thought we had the best horse, which shows how well matched we were. The inn-to-inn riders were staying in local bed and breakfasts and were very happy with their accommodations. Meals were also at local establishments, except for amazing sandwiches/sack lunches on the trail. Again, everyone was happy with the menus and service–– even those of us used to quite a variety of restaurants at home. For The City Slickers: Note that I took riding lessons (a) to make sure I could reasonably handle my horse, and (b) so I would not have sore legs at the end of the day. I recommend taking some riding lessons before going on a trail ride vacation, it is easier to look around and take photos if you're familiar with riding. The countryside is absolutely gorgeous and you will want to take photos! Also, you will be riding through a variety of terrain, from deserts to trees and scrub. DO bring gloves (as noted on the packing list) for pushing branches out of the way; DO bring bandanas, they come in handy for blocking dust, blocking sun and hiding your face during stage coach robberies (I may have imagined that last); and DON'T wear clothing that you will mourn if it is snagged by a branch. This Is The Way to Go! : Do you remember all those westerns you watched as a kid? That countryside is in Utah! 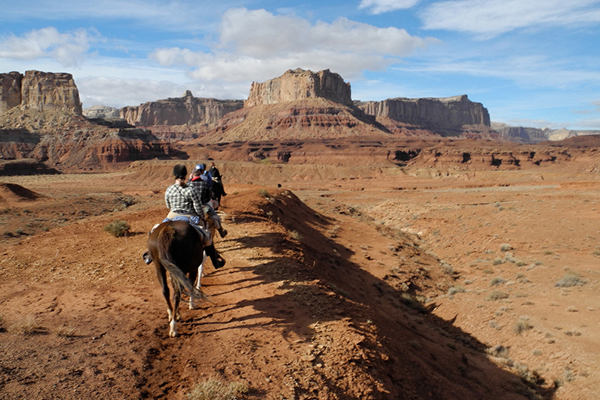 Horseback is a marvelous way to see the seemingly endless beautiful landscapes of Utah. 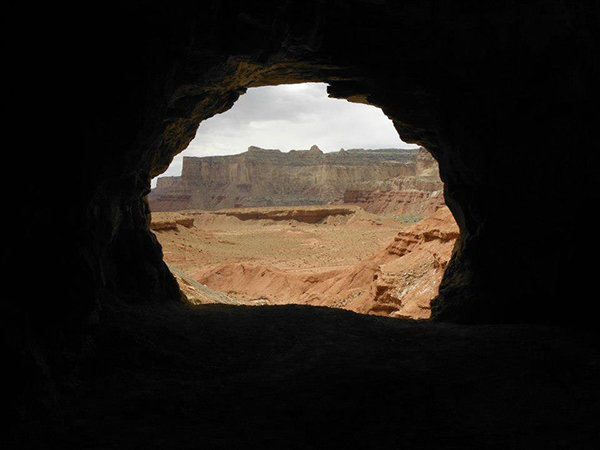 You get access to views that you would not otherwise see–– beautiful cliffs and rock formations, deserts, aspen forests, mountains with beautiful reflective lakes, and ancient petroglyphs/pictographs left by the native populations of the region. I highly recommend Hondoo Rivers & Trails to help you access and appreciate all of this while living the cowboy/cowgirl fantasy. 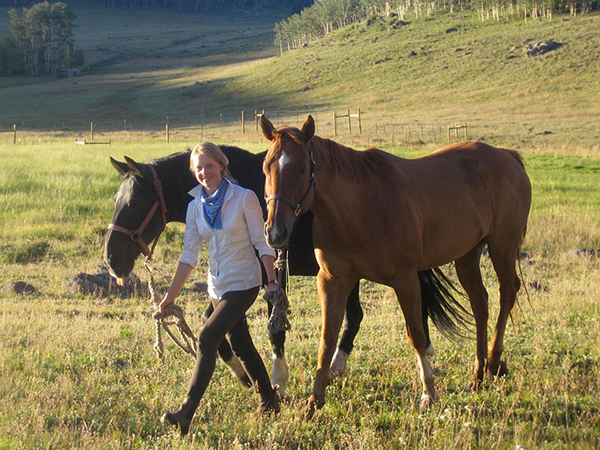 Learn more about riding in Utah on an inn-to-inn or camping vacation with Hondoo, who we filmed with for Equitrekking by info@equitrekking.com?subject=Equitrekking%20Hondoo%20Article-%20Pat%20inquiry%20for%20riding%20tour">emailing Pat, and check out Hondoo's page in the Equitrekking Vacation Guide. 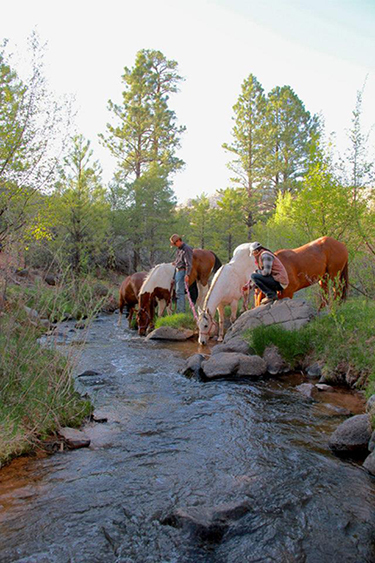 Mention Equitrekking and get 15% off your 2015 trip rate if reserved by Dec 31, 2014.